Scott, if you had everything in the world, where would you put it? The Everly Brothers once sang, “Every thing, Every where, Every time.” Let’s recap. We’re introduced to young Maddy (Amandla Stenberg). She has Severe Combined Immunodeficiency (SCID) and hasn’t left the house since she was three years old. That’s when her brother and father were killed in an automobile accident. Now, she’s celebrating her 18th birthday when something special happens: a cute young man named Olly (Nick Robinson) moves in next door. They strike up a relationship over text messages and begin to fall in love. Maddy and Olly arrange to meet in person, without Maddy’s mother’s permission. Soon they kiss, and shortly thereafter Maddy runs outside her home to comfort Olly after the boy has a violent run-in with his father. Maddy gets sick briefly but recovers. She realizes that she can’t avoid life and love forever, and so she applies for credit cards and arranges for her and Olly to go on a secret vacation to Hawaii. Maddy gets sick there, too, but soon the truth about her illness is revealed and forever changes her life. 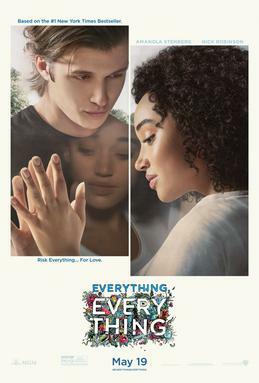 Scott Everything, Everything is based on the popular young-adult novel by the same name. We’ve seen many YA books translated to film with great results that appeal to both young and old. Sadly, EE does not fall into that category. EE is very simplistic in its dealing with disease, loss, isolation, and betrayal. This is more an “Afterschool Special” made for TV than a full cinematic presentation. I was very disappointed. As a case in point, Maddy seems very happy and well-adjusted in her closed-off world. She doesn’t seem to yearn for the outside life. After having spent her entire life within the same 4 walls, you’d expect that she’d have a pretty big case of cabin fever. And, she’s never had a crush of any sort. With her access to the internet and social media, I would expect her to have at least had an online romance. But she seems perfectly happy to create her scale models of diners and buildings as part of her architectural studies. I found it all a bit too simplistic. I guess I’ll be the contrarian here. Greg, Everything, Everything won my heart. How could anyone not love these two kids who fall in love and face seemingly impossible odds of their relationship working? The only possible criticism of this movie is that our two romantic leads are just a bit too perfect, too good-looking, and too well-adjusted. Given Maddy’s isolation from the world, you’d think she’d be more socially awkward, and given Nick’s violent father, you’d think he’d have some dark baggage for the audience to see. But even with the implausibility of these hyper-perfect kids, I was drawn into the story and was moved deeply. True, the film does have a made-for-TV feel, and yes, it’s a simple love story that won’t win any awards for originality. Yet I couldn’t help detect the metaphorical significance of Maddy’s SCID disease. 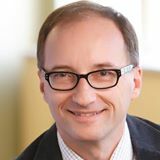 I believe that many people today, Millennials especially, have trouble “connecting” with people due to self-inflicted barriers to intimacy. I suspect that a lot of viewers of this film can relate to feeling separated from others and feeling unable to find love. It’s no coincidence in this movie that the barriers to love are dismantled once they are discovered to originate from the corrupt older generation, a theme we’ve seen in many YA dystopian future movies such as Hunger Games and Divergent. The two characters represent a romantic duo. But the story is clearly Maddy’s. It’s all about her isolation, her new-found love, and her ultimate ambition to escape the confines of her home. Olly is the catalyst for her journey and in many ways a mentor to her as she reaches out to a world beyond her jail. She starts out naive and ultimately learns a difficult secret. She’s a good hero – but not great. She has no flaws that we can see. She’s beautiful, polite, refined, obedient, and just too perfect. To be relatable, we need heroes to have some flaws. Good hero stories usually feature heroes who transform in significant ways. In this film Maddy does grow socially and emotionally. She also acquires an important insight about her mother, a painful mental transformation she must undergo. Olly grows in similar ways but we’re not as privy to his transformations. In our last book, Reel Heroes & Villains, we noted that one thing that separates heroes from villains is that heroes transform but villains don’t. Everything, Everything provides ample evidence of this distinction. The film’s villain, Maddy’s mother, does not see the light and in fact cannot see the light. She needlessly imprisons her daughter and never becomes enlightened about the cruelty of her actions. She remains stuck in an untransformed state. Everything, Everything is The Boy in the Plastic Bubble for a new generation. It also resembles another film: The Space Between Us. EE is very light fare made for the younger viewers in the audience – especially young girls. It treats Maddy’s situation and illness with a light touch and so is appropriate for that group. I give Everything, Everything 3 out of 5 Reels. Maddy is a bit too perfect in every way. She undergoes a great transformation from acquiescing to her mother’s every whim, to becoming a full adult and making decisions for herself. The realization at the film’s end – where Maddy learns that her mother made up her illness – is a devastating moment for her and a stark illustration of how fragile trust is. I wish that Maddy were a more realistic character, so I give her just 2 out of 5 Heroes. There’s not a lot of transformation other than for Maddy in this film. Olly is pretty much who Olly is all throughout. And the other ancillary characters are mere shadows. I can only muster 2 out of 5 transformation Deltas for Maddy’s transformation. I’ll acknowledge some of the weakness of this film that you point out, Greg. Yet the bottom line for me is that Everything, Everything moved me at a deep emotional level, despite the flaws we’ve identified. This movie tugs at our heartstrings in telling a timeless tale of unrequited love, and in doing so it evokes strong emotional payoffs. I give the film 4 Reels out of 5. Our two romantic heroes go on a classic hero’s journey and help each other grow socially, mentally, and emotionally. These heroes possess most if not all of the qualities in the “great eight’ traits of heroes: they are smart, strong, reliable, resilient, charismatic, caring, selfless, and inspiring. I award our heroes 3 Hero rating points out of 5. As I’ve noted, both our heroes help each other grow and transform in significant ways. Moreover, we sadly see that Maddy’s mother suffers the fate of most villains in good storytelling. She remains stuck and in denial, thus forever untransformed. The lesson is clear here and in all good stories — unless you are willing to grow and change, you risk either painful stagnation or, worse, a harmful regression that poisons hearts and relationships. I award these characters 3 transformation Deltas out of 5. By Greg Smith in 2 Deltas, 2 Heroes, 2017, 3 Reels, Drama, Romance, Uncategorized on June 5, 2017 .